At the very moment you are reading this article, there are around 65,000 people up in the sky at about 40,000 feet. Every day, more than 8 million individuals fly from one point to another. Some people consider flying as part of their lifestyle, others for travelling to their favorite tourist destination and many people do it for business. Travelling by plane has never been easier, affordable and accessible. Commercial airlines are competing to have you onboard their high-tech aircraft and experience their customer service. Majority of them are well-equipped with food, safety training and entertainment tools. If you think an eight hour flight is considered a long-haul then maybe you should know how long it can take for someone from Japan to go to Argentina. It is a long, dreadful probably life-changing 23 hours. Can you imagine being in the air for a whole day? I personally might have become a changed person when I landed to my destination. But the most concern I have is how I keep myself entertained. I’m satisfied with a good 7-hour sleep, but what can I do with the rest of 16 hours. If you are about to face this kind of long-haul flight then here are some tips to keep yourself entertained. Playing games will keep you entertained and busy. No, you do not need to bring your gamers setup like your whole PC system or VR setup. Try playing card games or board games instead. They may be old-fashioned games but they are way more socially interactive than their virtual counterpart. In addition, it can take up much more time to complete a whole set of game. If you really insist in playing your millennial game then you need to bring your gaming gadget like Nintendo Switch, 3DS or Sony PSP. If that is too much hassle, you can settle with your smartphone. There are many compelling, entertaining games available in app stores anyway. Just make sure you bring your power bank with you. Watching a movie or a TV show is the most effective way to keep someone entertained in land and even in air. While many airlines are equipped with a good selection of movie titles and compilations of TV shows, there are several who offer programs you’ve probably seen 2 years ago. To make sure you are occupied for at least two hours, average length of a movie, you can download movies on your watch list before boarding the plane. If you feel like you are spontaneous then bring your laptop and other streaming gadgets on hand carry and connect it to the airplane’s WiFi. Yes, major airlines provide internet connection. Expert traveling tip: you can bring your streaming device to your hotel so that you are always connected to your favorite shows. What more can you do with your time while enclosed in a capsule flying thousands of feet above ground? Socialize my friend. Humans are innately social animals so be friendly and make new friends. If you are travelling, this is a great way to start your journey. Break the ice by smiling and saying hello. You will be amazed by how you can easily meet an individual that is far from the usual people you meet. In addition, chatting with strangers actually gives you a little bit more of confidence and more openness about sharing your opinions about certain, usually considered sensitive, topic. Whether you are a Dan Brown, Mark Sullivan or Kevin Kwan fan, being in a long-haul flight is the best opportunity for catch-up with your book. 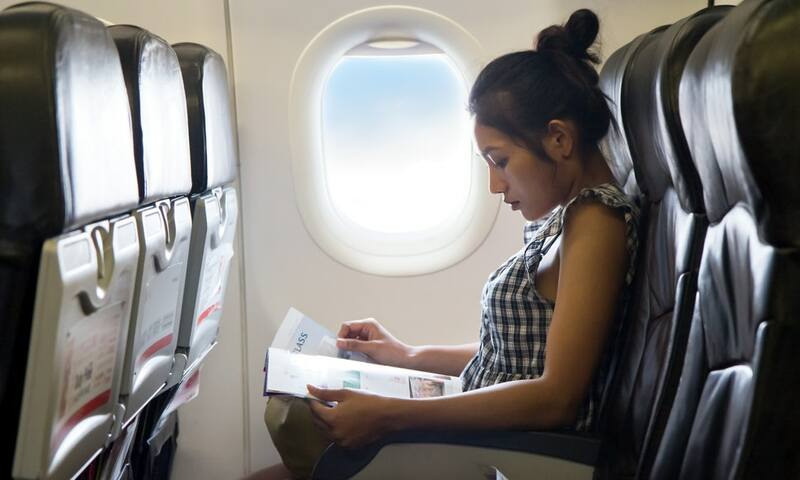 There are probably a number of magazine and newspaper available in your flight, but nothing beats the way time is spent while reading a good book. Getting absorbed and immersed in a story will make you unable to put your book down. As a result, you don’t only get to read a book, keep yourself entertained but you are also able to cross another title in your must-read list.